If you are an adult or a teenager learning the piano, then this could be the most important invitation you will ever receive. Most people are really keen when they begin learning to play the piano or keyboard, but many soon give up because they find reading music notes too difficult. They cannot find the notes on the piano keyboard. They struggle to remember which note is which on the staff. They confuse the bass staff notes and the treble staff notes. You might be a first timer taking up a new interest in music... or maybe this is your second go at learning to play the piano. Like most music students, you dream that you'll soon be playing your own favorite songs on the piano. Perhaps you look forward to the fun of playing the piano for your family and friends. And maybe you'd even love to create your very own beautiful piano music. But then you will soon discover a problem nobody warned you about: that music notes are difficult to learn. 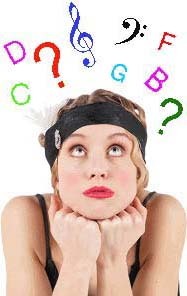 Most music courses just expect you to remember the notes on the piano by repetition alone... with the result that you often end up just having to guess what the notes are! If only you could break through this learning block, you would be able to fulfil your lifelong dream of sitting down at the piano and playing beautiful music! I have been a piano teacher for over 30 years. I have seen this problem so many times. I have surveyed all the piano teaching books, courses and ebooks on the market, and frankly, not one of them really helped my students learn to read music notes in a quick, systematic way that was also fun. So I decided that if I couldn't find a book, course or ebook that did these things, I would write one myself. Reading Music Notes With Ease for the Adult Beginner. "When I was at school I started learning the violin. The teacher did not know that instead of learning to read music I was simply memorizing all the tunes. When I couldn't remember any more tunes I gave up trying to learn the violin! This enjoyable new system enables me to actually read and understand music. Now at last I will be able to achieve my longterm goal of learning to play the piano! Yeah!" This ebook makes learning music notes fun and easy, and is designed to help you WHIZ through learning music notes. You will learn music notes with a brand new memory technique, combined with a dash of fun -- which makes learning a breeze, not a chore. You will rapidly gain confidence as you learn to recognize all the 21 notes on the bass and treble staffs -- using a systematic method, not just rote learning. You will be hugely entertained by the hilarious voices of the 'Gang of Seven' characters used in this ebook. Embedded behind all the illustrations of the Gang of Seven members are voice clips that you can play as you view the ebook on your computer screen, simply by clicking on each picture with your mouse. You will also enjoy playing the music clips embedded in all the keyboard and staff diagrams. As you listen to every note that is discussed, by clicking on the diagrams, you will easily relate the material to your own keyboard. 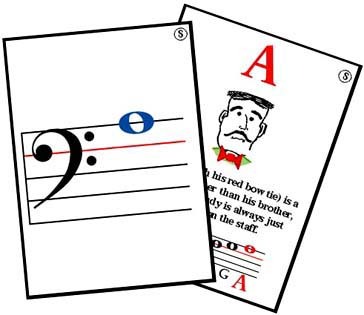 You will get a feeling of achievement as your knowledge of each music note is locked in when you use the free bonus flash cards. This ebook's simple explanations of basic music terms such as octaves, bar lines, ledger lines, and the bass, alto, tenor, and treble clefs will help you master the fundamentals of music theory. 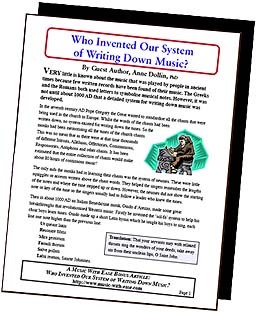 Also included in this ebook is a unique Gang of Seven Musical Map Chart that will give you an overview of all the notes on the Great Staff. (This makes a great teaching aid to frame and set up near your keyboard or piano!). And best of all... your enthusiasm for music will grow stronger day by day as this ebook helps you easily conquer the biggest obstacle facing new music students -- how to read music notes. Music notes become easy with clear colorful diagrams! to read music notes so easy? you will receive the following 4 FREE BONUSES! Along with your 29 page ebook, Reading Music Notes With Ease, you will receive a further 26 pages of bonuses. Exceptional value -- just for placing your order right now! 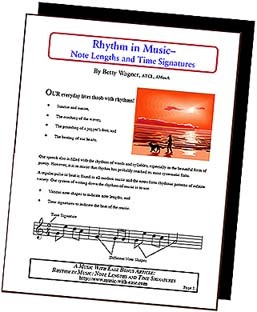 You will also receive the free bonus Music With Ease article, Rhythm in Music, that takes you on a guided tour through notes, rests, and time signatures. an explanation of asymmetric time signatures. 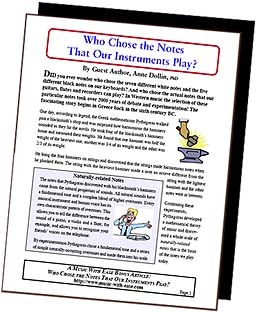 Who Chose the Notes That Our Instruments Play? Seven notes were chosen that are used in the vast majority of instruments today. Who Invented Our System of Writing Down Music? "I really like the flashcard portion of the book especially. I have put them by the piano and review it before I start practicing each day, and it is definitely helping me. I am very glad to have ordered the book. Thanks for offering it online." "I liked the system very much. I especially like the flash cards." "I purchased your ebook a few nights ago, and it is great! Easy to understand, the little characters are really cute. I found your ebook to be very helpful." "I had been struggling to learn to read music and to put together the keyboard with the written notes. I could not see the logical relationships between the written notes nor could I remember them quickly enough to play them. 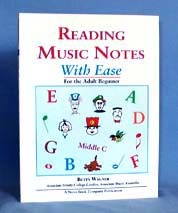 After thirty minutes of reading through your book, 'Reading Music Notes with Ease for the Adult Beginner,' I saw it all so clearly and could remember it so much better. Your way of personifying the notes and their relationships reminded me of how my father used to remember post offices for sorting the mail as a postal clerk. It works! Thanks! Your system has taken me to the next level. I am excited about teaching my 4 and 6 year-old with your system next!" "I bought your book because I wanted a fun way to teach a 14 year old boy his notes. Common books were too babyish but this is just great." If you are dissatisfied with this ebook for any reason, your money will be cheerfully refunded. To get a refund, just send an email within 8 weeks with the email address you used when you purchased the ebook and your money will be refunded. You can keep the flash cards and bonus articles even if you request a refund -- just for spending the time to look over Reading Music Notes With Ease for the Adult Beginner. You'll be downloading the book in just two minutes from now (no matter where you live and even if it is 1:00 am). This guide is in electronic book (ebook) format, which means you can download it right on your computer and you can start using the great techniques just seconds after purchasing. Your order will be processed securely through ClickBank / PayPal -- your information will be 100% confidential. Click here to read why it's completely safe to order online through ClickBank/PayPal (will pop up in a new window). This ebook is in PDF format. It will work on all computers running Windows 98 2nd Edition or later, and Macs running Mac OS 10.2.2 or later (for earlier Mac versions, click here). The programs, Adobe Reader and QuickTime, are needed. Most computers have these programs already. But if you don't, you can download them easily and for free (we give you full instructions). So take a deep breath and prepare yourself to put away all the money you thought you had to shell out to pay for extra music lessons -- and use this 100% foolproof music note learning method to learn your music notes faster than you ever imagined. Click here to order now, risk free, and start learning notes fast and easy -- beginning today. Click Here To Pay By Credit Card or PayPal! P.S. Learning to read music notes is critical for your musical success. The $14.97 you invest in this ebook is only a tiny fraction of the cost of your music lessons. Yet it will ensure that you will breeze through learning your notes -- so that you can enjoy the fun and excitement of becoming a piano player! © 2005-18 Music With Ease/Nova Book Company. All Rights Reserved.